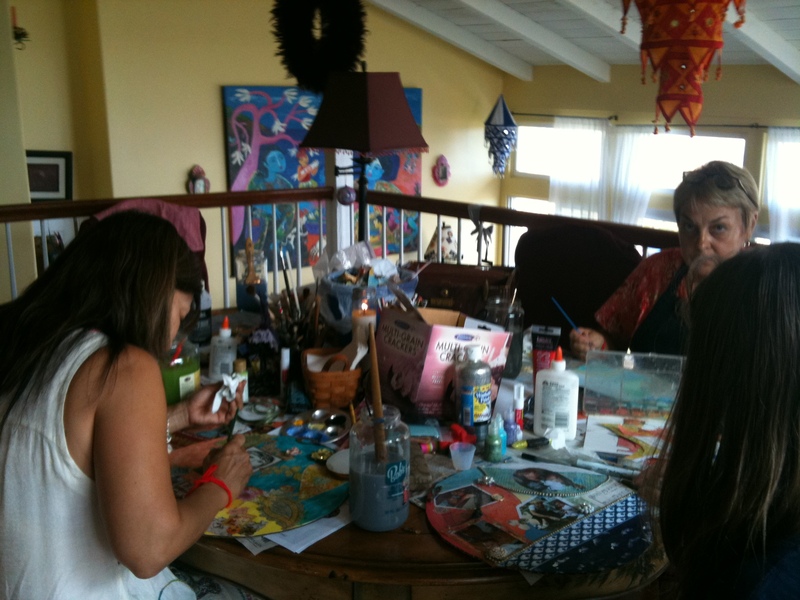 Glitter Gypsy’s Art & Adventures Update! Aloha All! February is going to be a full month! 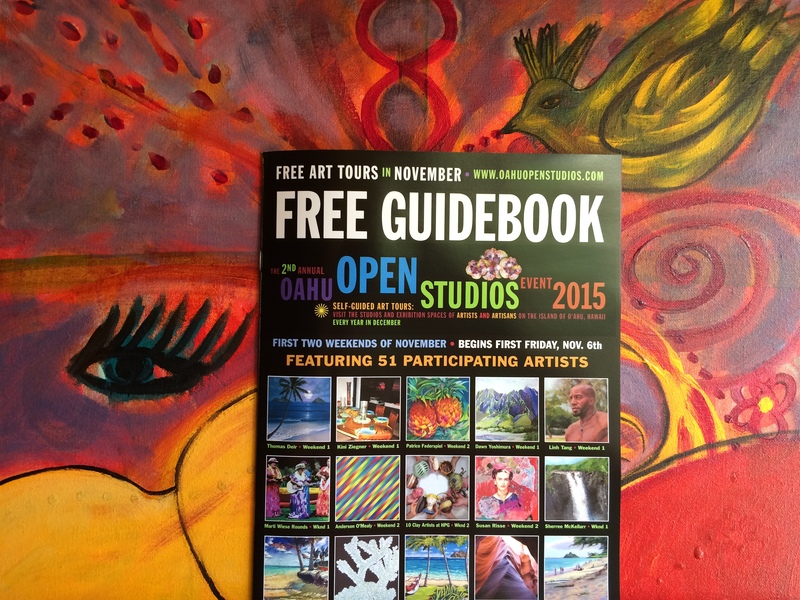 Glitter Gypsy’s Art & Adventures is actively supporting local events and wants to share the fun with you. From film openings to Night Markets to On-line Art Workshops, the sparkle is being spread! 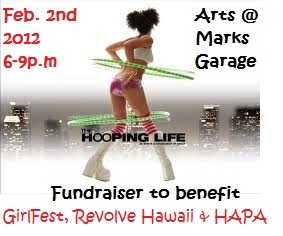 The Hooping Life Film Screening is a fundraiser event raising awareness and funds. 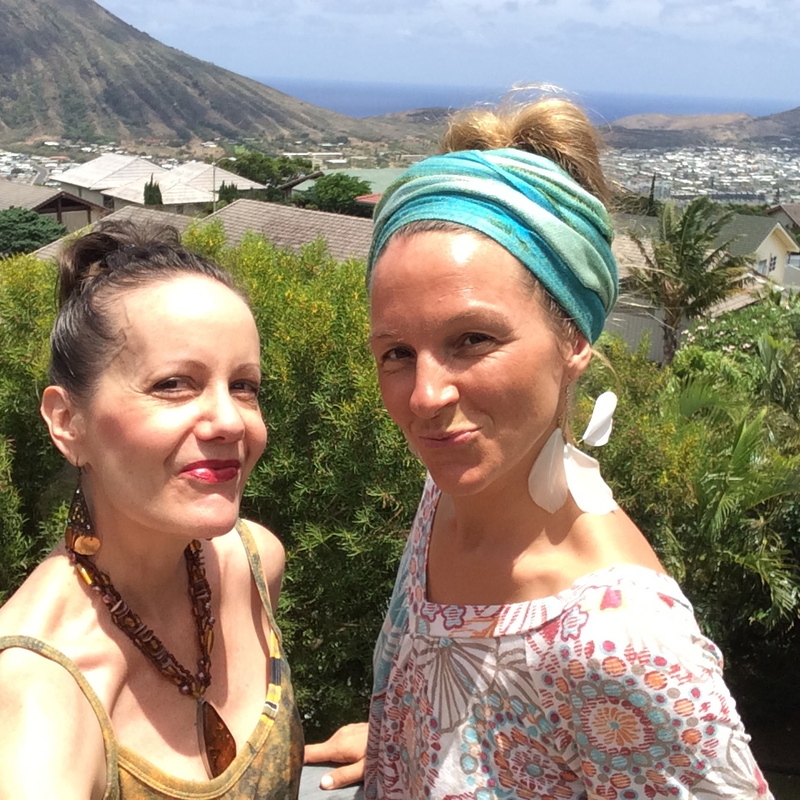 The film documents the hula-hoop phenomenon and supports art, dance and culture and is brought to you by R(e)volve Hawaii and local sponsors like Glitter Gypsy, Susan Conrad Risse. 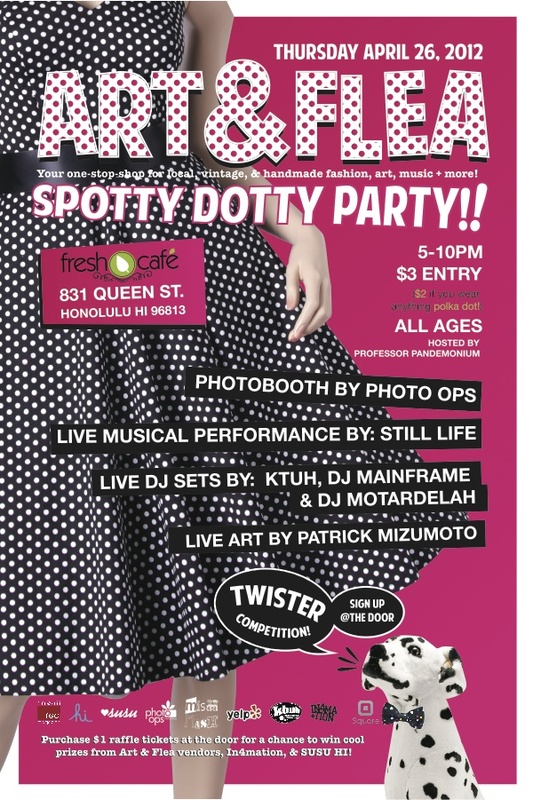 8:20-9:00pm DANCE PARTY! Hoops to try and music for the vibe! 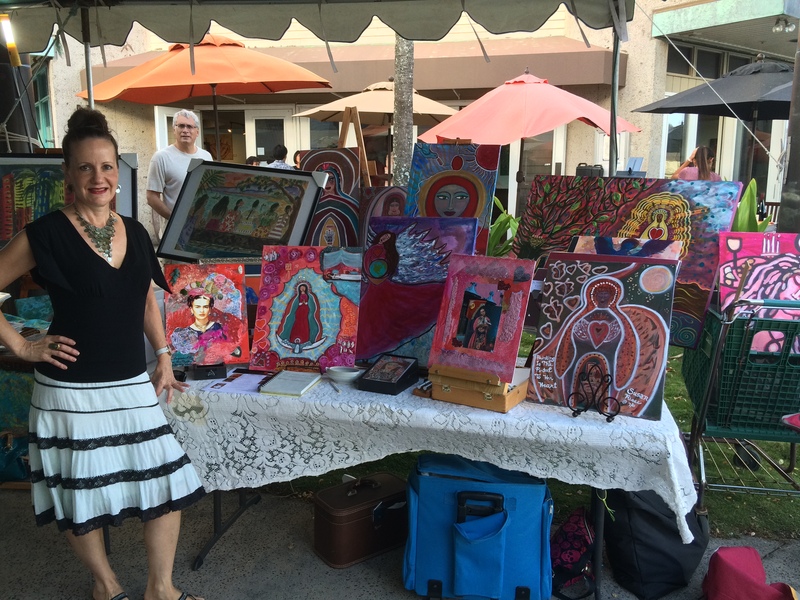 The following evening, Glitter Gypsy Art and Adventures takes you to a night market in Honolulu’s Chinatown District where you will discover more local artists! 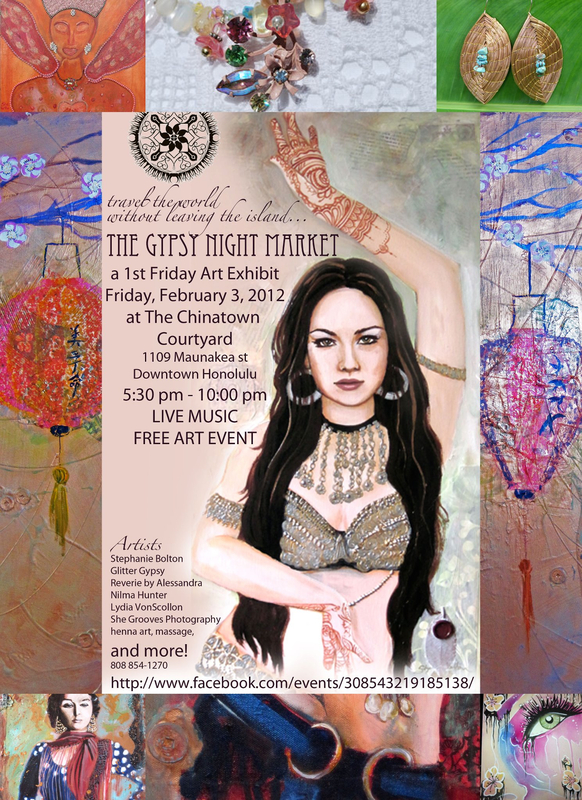 GYPSY NIGHT MARKET in Chinatown (Honolulu) for February’s First Friday Arts on February 3, 2012~~5:30-10:00p.m. 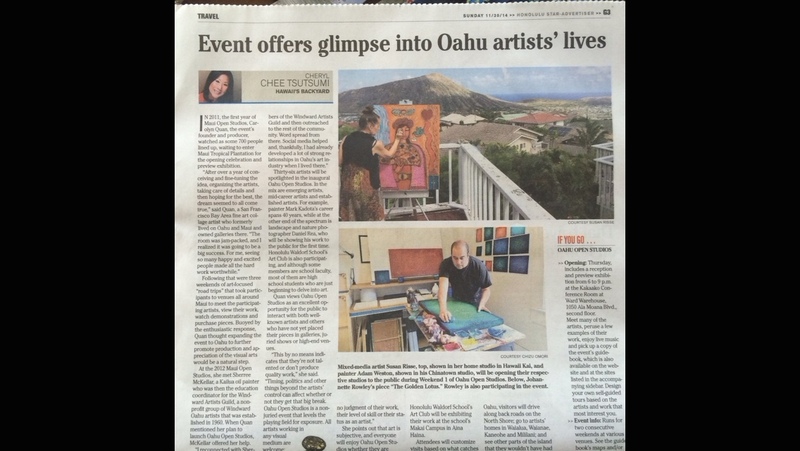 We will be in the “Chinatown Courtyard” at 1109 Maunakea St, Honolulu, HI 96817. Come be a part of this eclectic and exotic event. 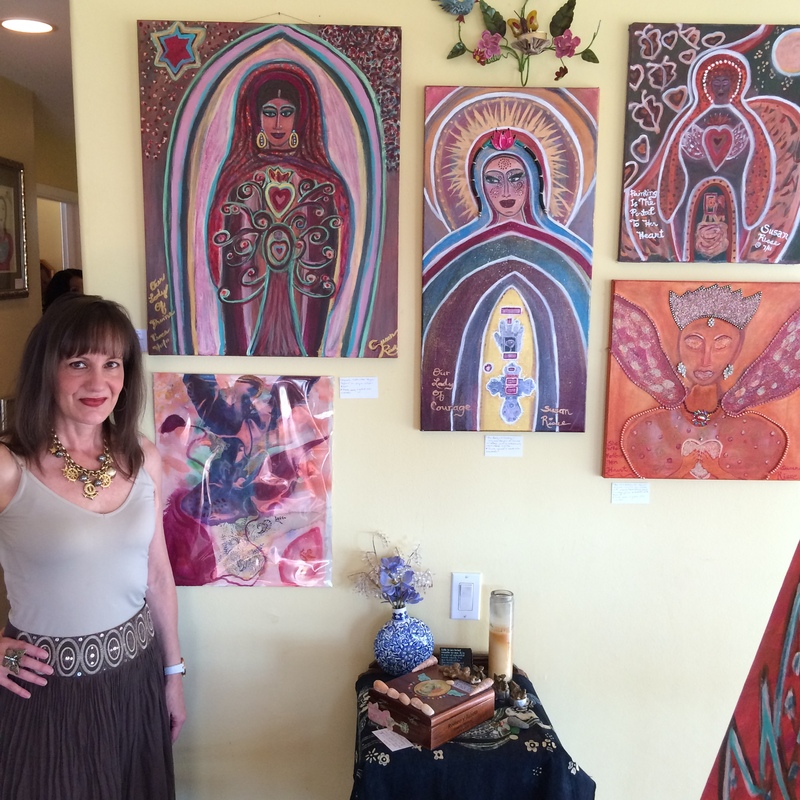 “Angels In My Studio” Course will be featuring Susan Risse as a guest teacher in March. 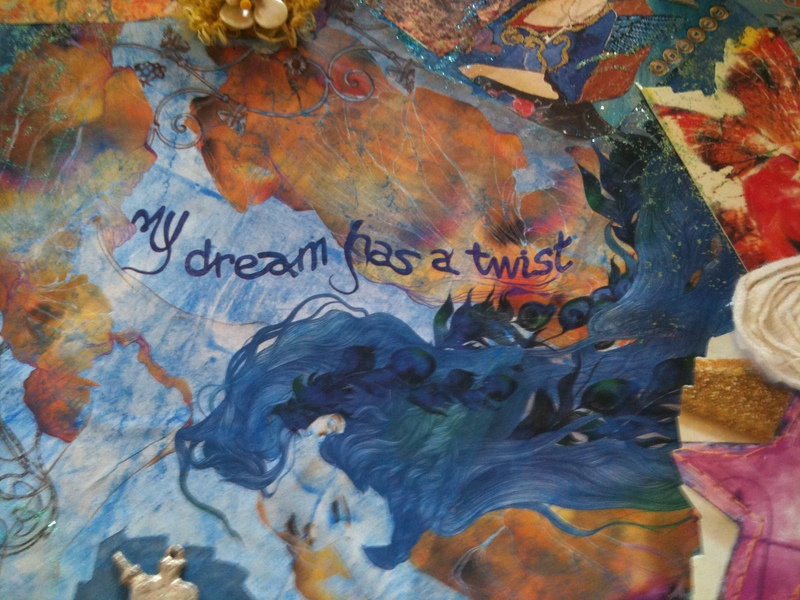 The transformational process of the art we create can be powerful. 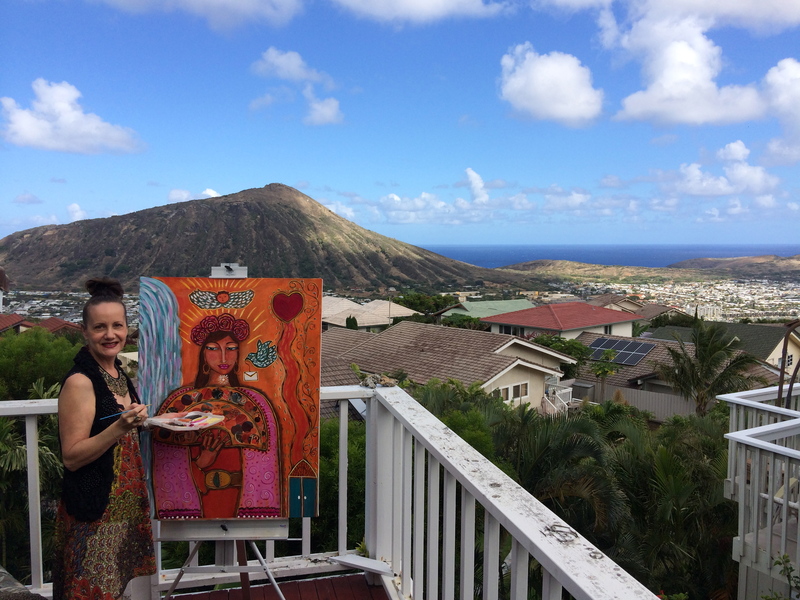 Join Susan as she shares her methods of both connecting with the divine and imparting its message through art. 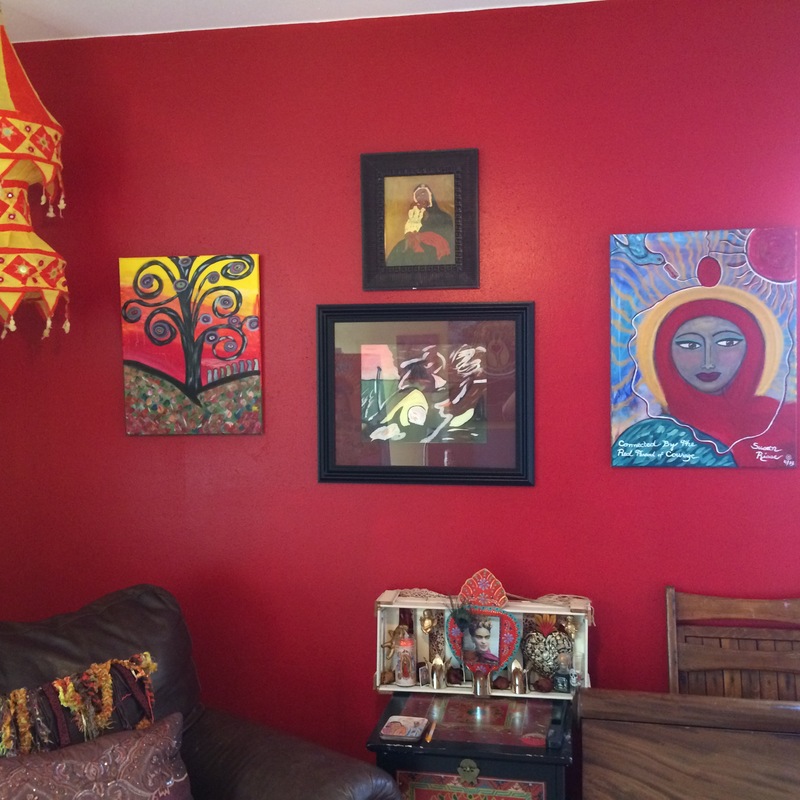 “Angels In My Studio” lessons will be delivered each month through embedded and downloadable video, audio, and written word. The first lesson will be released on May 1st. More details coming soon! 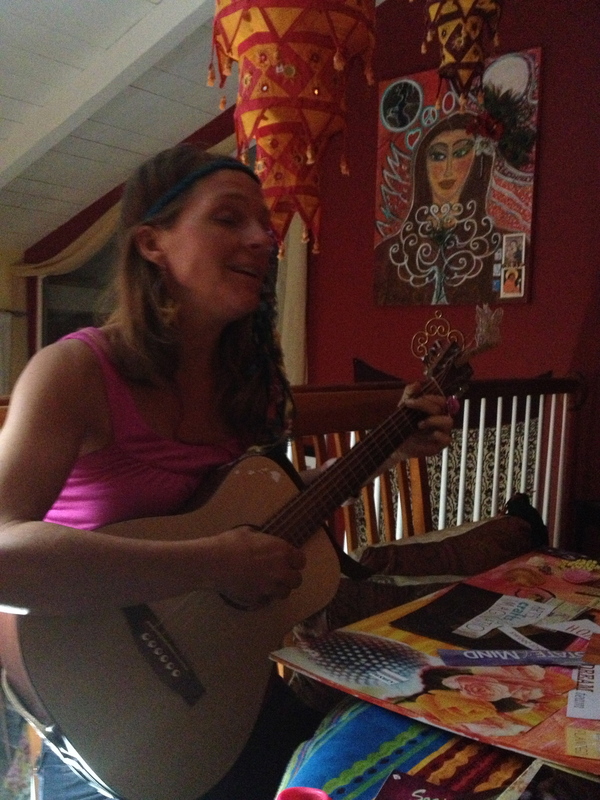 Follow your HeART, even if you don’t know where it’s leading you…..
Hi, my glitter gypsies! How are you today? I am very well, thank you! 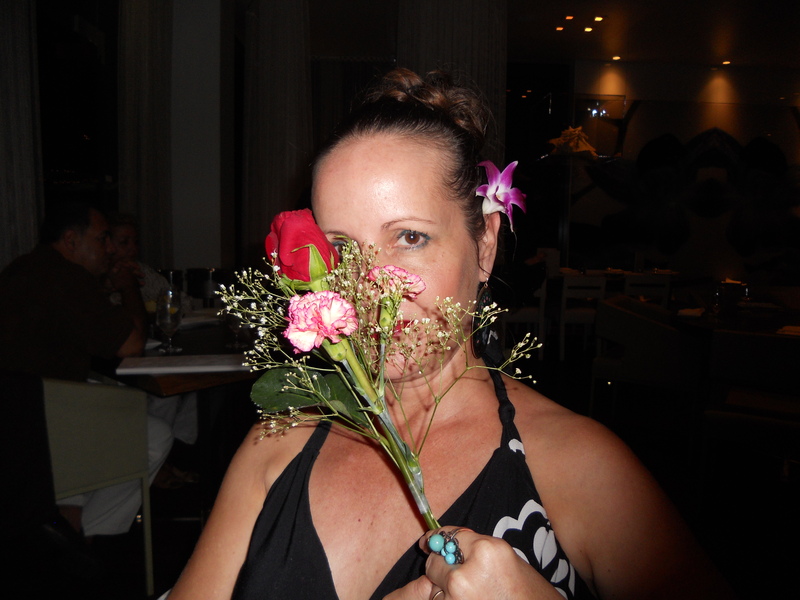 I want to send out a BIG MAHALO to all of the beautiful women & girls who attended my 1st retreat of the Fall Series on 9/10/11! 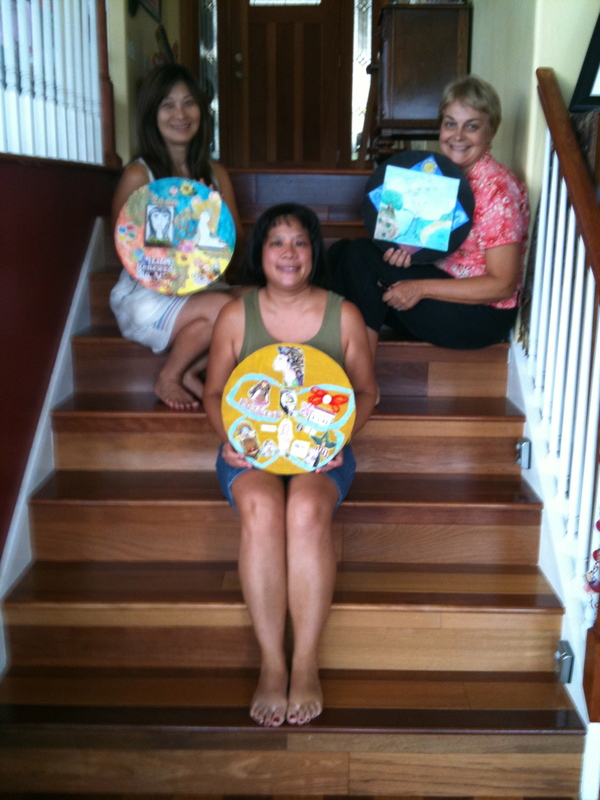 We had a terrific time & everyone left with a finished Mandala that they all really loved! It was so fascinating to watch while each person created something from their own heART, not really knowing the outcome, but trusting in the process. 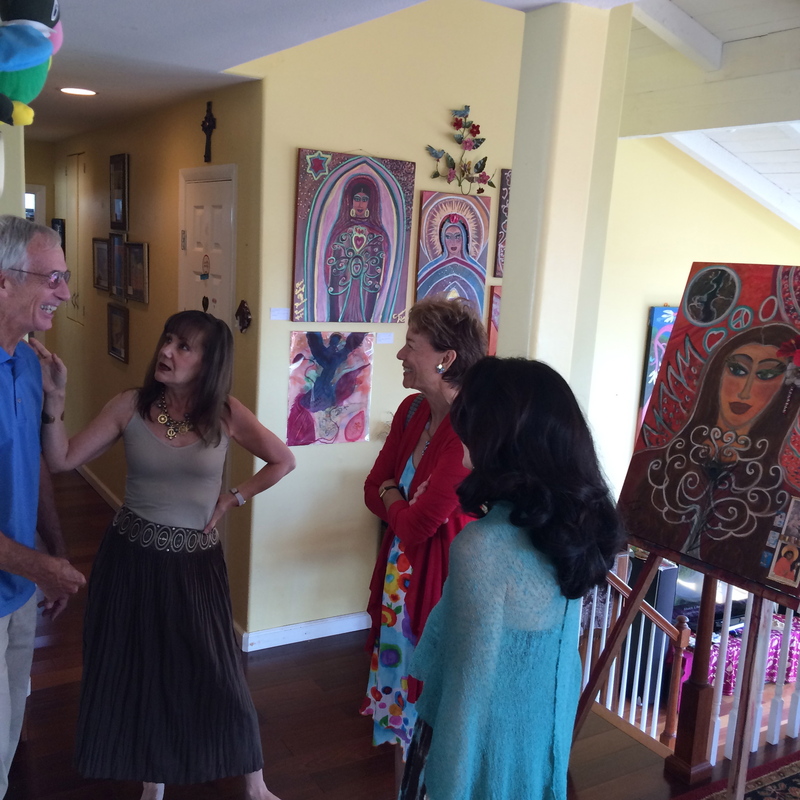 Lots of support & inspiration were flowing freely & lovingly. 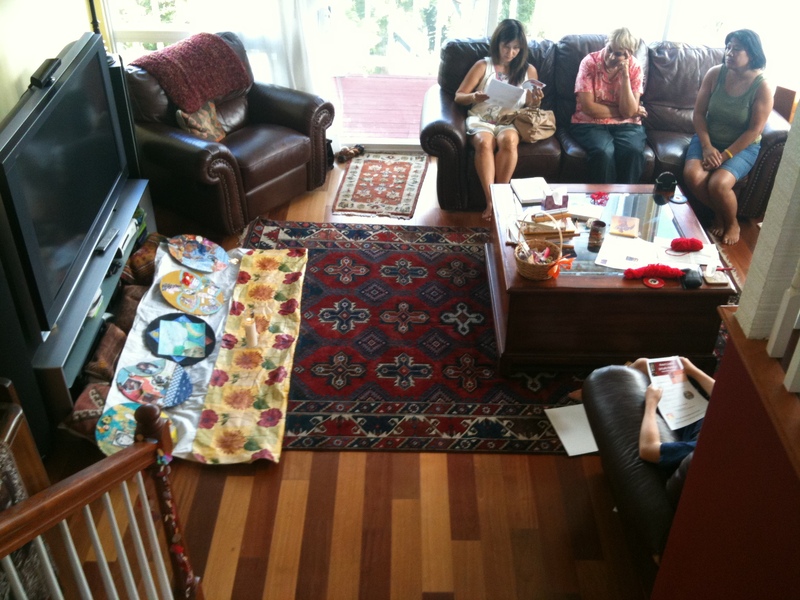 The Mandalas all turned out very differently, reflecting the personal journeys that each person was on. We began in a Ritual, known as “the Red Thread Ceremony.” Many years ago, my teacher, mentor & artist extraordinaire, Shiloh Sophia McCloud, introduced me to this ritual & passed it on to me to share with even more women. It is a way of creating a vessel, or sacred space, to hold all of us safely in the arms of freedom to create that which is wanting to be expressed, even if we’re not sure exactly what that is. It was a beautiful & blessed day, to be sure. Again, I would like to thank all of the women & girls who joined me on 9/10/11! Which brings me to the next workshop on 10/01/11, 10:30-5:30 again. This time, we will be creating 3-dimensional shrines (or memory boxes. )An amazing workshop that you won’t want to miss!!! Just go to the Home Page & click on Personal Shrines & Memory Boxes button & all of the details are there. If you have any questions, feel free to contact me. Sign up early, & get a discount + save your spot! Hope to see you there!!! Still Time To Sign Up!!!! On this very significant weekend of not only the 10 year anniversary of the tragedy of 9/11/2001, but also, the numerical significance of the date tomorrow(9/10/11), as well as the “Full Moon in Virgo”, there is definitely a lot of energy moving around in the Universe. 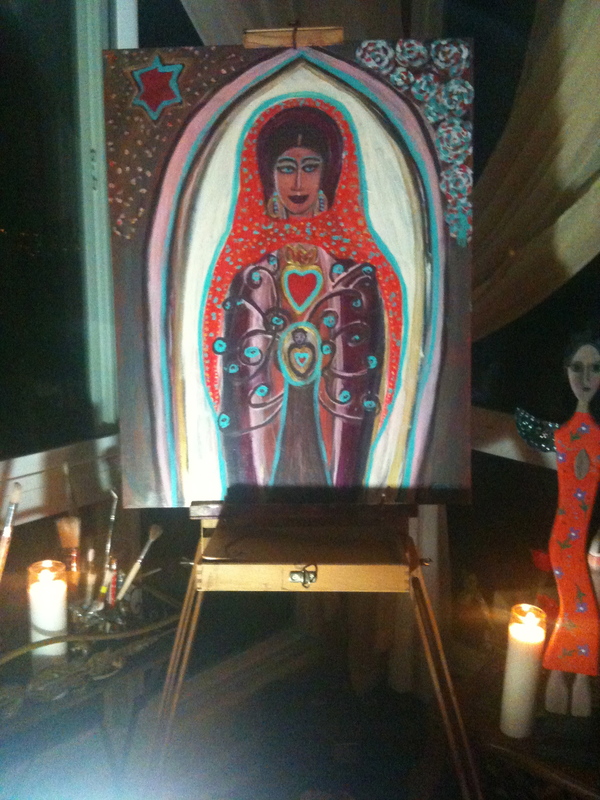 Last night, I was up into the wee hours finishing this painting, “Our Lady of Peace and Love”~~dedicated to WORLD Peace and Love on this, the anniversary weekend of 9/11/2001. I really wanted to go to sleep, as I need my rest to be ready to lead my “Women’s Creative Spirituality Workshop” this weekend. But, for some reason, this beautiful Lady kept calling out to me in Her gentle & loving way. “I need you to finish this, BEFORE this MOST SIGNIFICANT weekend to spread love & peace in the World. THEY NEED ME & this is something that you can do, in your own small way, to be a part of that POSITIVE energy.” So I listened, & I did it & here She is! I’d also like to invite you to be a part of this “POSITIVE ENERGY MOVEMENT” with ME tomorrow at my Workshop! I REALLY want you all to come! This time, don’t worry @ $$. Payment plans & scholarships are available. This is about something BIGGER for me, for US. Please sign up, I will make it work!